IF THE BOMB FALLS: Vinyl Instructions from 1961 for "Sheltering in Place"
2/16/04: In a telephone interview with former CBS president Frank Stanton, it is confirmed for the first time by an on-the-record source, that Arthur Godfrey recorded a special announcement to be played in the event of an attack on the United States. "That's true," Stanton states when asked to confirm the existence of the tape. "It was Murrow and Godfrey (who made the recordings)." The retired broadcast executive does not know any of the specifics of the recording, nor can he confirm where the tape(s) was/is stored. When asked a second time whether he is certain such recordings were made he answers with a firm "absolutely." It should be noted that Stanton's credibility on this issue is particularly strong as he is the only living member of the Eisenhower Ten. The Eisenhower Ten was a select group of individuals who were appointed by President Eisenhower to serve in critical government roles in the event of an atomic attack or other disaster. Had such a catastrophe occurred (during the period 1958-1961), Dr. Stanton was to have served as Administrator of the Emergency Communications Agency. 2/3/04: In a telephone interview with Gen. Andrew J. Goodpaster (USA, Ret. ), Staff Secretary to President Eisenhower from 1954-1961, the question of the existence special Continuity of Government tape recordings made by Arthur Godfrey and Edward R. Murrow is put to the General. Goodpaster, who is now a senior fellow at the Eisenhower Institute, states: "I wouldn't be at all surprised because Eisenhower had high regard for Godfrey and Murrow..." Goodpaster adds that it would have been in character for the President to have called upon the two well known personalities as he would have considered the importance of relying on known voices to deliver such an important message. However, the General hastens to note that he does not have any direct knowledge of such recordings. 01/04: A senior archivist at the Dwight D. Eisenhower Presidential Library is contacted to see if any documents related to the alleged Godfrey tape (since 1992) have been declassified. The archivist states that there is one document that may have some relevance. But because the document is still classified he states he cannot divulge any specific information. The archivist invites CONELRAD to file a "Mandatory Review" request. CONELRAD files the request in February of 2004. 02/24/02: The latest Arthur Godfrey Doomsday PSA update comes courtesy Emerson College professor and Godfrey biographer Arthur J. Singer. Prof. Singer had access to voluminous amounts of archival information concerning the famed broadcaster (though not that elusive PSA itself) and was kind enough to assist CONELRAD in its quest. GODFREY: It was thought by the Eisenhower administration that two voices were well known and trusted, and it was pretty tough to imitate us. One was Edward R. Murrow who had become much beloved during World War II for his broadcasting from London...and the other was Godfrey. And it was a great honor for me to be considered on the same level with Ed. Also revealed during the WNET interview was that Godfrey's Virginia farm - which was a short distance from Mount Weather (a main government relocation center) - was designated by the government as a temporary hiding place for then-Vice-President Richard Nixon. CONELRAD would like to thank Prof. Singer for faxing this dispatch in. 1953, March 20. "Bomb Target, U.S.A.," a radio documentary narrated by Arthur Godfrey on the current state of America's defense readiness against atomic attack. Correspondents Charles Collingwood, Dave Moore, and Peter Hackes cover a simulated "enemy" atomic attack designed to test defense reactions. The program includes interviews with military leaders, civil defense officials, and private citizens. CBS. 60 min. Is it possible that the long-sought Godfrey PSA exists only as part of a radio documentary simulation of an atomic attack? Does the famous broadcaster issue a mock announcement on this tape to add realism? Is it possible that over the years (helped along with Godfrey's boasts) the story evolved into the version published by TIME? 12/99: CONELRAD is contacted indirectly by an individual who performed research for a television biography on Godfrey. This individual informs CONELRAD that Godfrey had stated once to an associate that in the event of a nuclear attack he was to be taken to a government relocation center in the mountains of Virgina to broadcast to the nation. This source adds, however, that Godfrey was prone to self-important boasts. 08/99: Chuck Howell, Curator of the Library of American Broadcasting at the Hornbake Library, University of Maryland, College Park, MD. informs a CONELRAD researcher that, while his film/video collection does not contain such a PSA, the audio collection contains over 2000 Godfrey tapes. Howell states that he has instructed his staff to remain on the "lookout" for the PSA. To date, no tape has surfaced. 06/99: Matthew Ellefson, an assistant to historian/Eisenhower biographer Stephen Ambrose, replies to a query mailed to Dr. Ambrose by CONELRAD. He states that the Eisenhower Center (Ambrose's foundation in New Orleans, LA) does not have any record of such a document. He adds, however, that it was his sense that such a document, if it exists, would still be "under seal." 05/99: Gerald Posner, the investigative journalist and author of several critically acclaimed books (including the ultimate JFK conspiracy debunking tome "Case Closed"), is contacted by CONELRAD. Posner indicates he will do some informal checking with his sources. A week later he states in an e-mail that he has found nothing to substantiate the existence of the Godfrey message. 05/99: A letter is sent to the Eisenhower Presidential audio visual archives requesting that a search be done for the PSA. To date no response has been sent. 04/99: CONELRAD, a website devoted to Atomic Culture, is founded. The Godfrey PSA is announced by the creators of CONELRAD as the "holy grail" of the site. 10/92-04/99: No activity. The Information Age arrives and explodes. 10/92: A letter from the National Archives arrives and indicates that most "continuity of government" documents are and will remain under seal. The issuer of the letter helpfully suggests that we should go to the Dwight David Eisenhower Presidential Library in Kansas to further our research. 09/92: A letter is mailed to journalist Ted Gup at Time Magazine requesting further details on this facet of his story by CONELRAD co-founder Bill Geerhart. No response is ever sent. 08/15/92: A FOIA [Freedom of Information Request] is filed with the National Archives in an effort to determine whether the tape exists by CONELRAD co-founder Bill Geerhart. 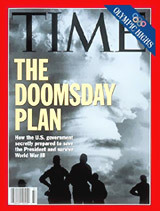 08/10/92: TIME MAGAZINE (Cover Story) "The Doomsday Blueprints" pp. 32-39 by journalist Ted Gup is published. The article contains a paragraph that announces to the world the news that, in the 1950s, Arthur Godfrey - at the behest of President Eisenhower - recorded a brief message to be broadcast to the nation in the event of an atomic attack.